Specific Crystal Management FCD Dry Food for Adult Cats is a complete and balanced diet to help prevent the recurrence of struvite and calcium oxalate stones in adult cats. 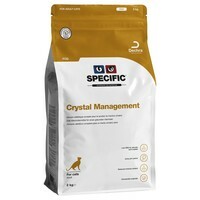 Made with a reduced mineral content, particularly magnesium and phosphorus, Specific Crystal Management will help prevent new crystals forming, whilst also helping to dissolve existing stones by making your cat’s urine more acidic. Fish Meal, Maize Protein, Pork Fat, Maize, Wheat, Potato Protein, Egg Powder, Rice, Maize Starch, Animal Protein Hydrolysate, Minerals, Vitamins and Trace Elements (including Chelated Trace Elements), Fish Oil, Cellulose Powder, Methionine, Ammonium Chloride, Psyllium Husk, Chondroitin Sulphate, Taurine.